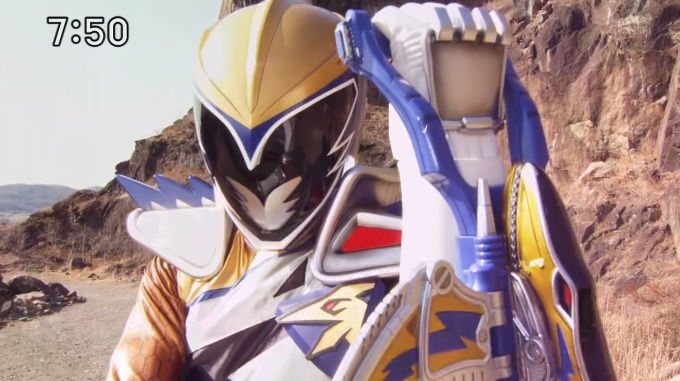 Zyuden Sentai Kyoryuger episode 10 is entitled: Zandar! Gold Revival "Zandā! Gōrudo Fukkatsu" (ザンダーッ！ゴールドふっかつ). The Kyoryugers discover Dogold's true identity is that of Utsusemimaru, the Sengoku period's Kyoryu Gold. Daigo tries to figure out a way to defeat Utsusemimaru's swordsmanship by asking Souji's father for help in swords training, Ian and Nobuharu try to figure out how to stop the Deboss-controlled Pteragordon, Amy and Souji are still captured by the Deboss Army, Utsusemimaru finally regains his memories, and Torin tries to find a way to save everyone from danger.